(1) McCabe's firing came as the result of information gleaned by the Justice Department's nonpartisan Inspector General. Michael Horowitz was appointed to that position by President Barack Obama and was confirmed by a Democratic Senate. 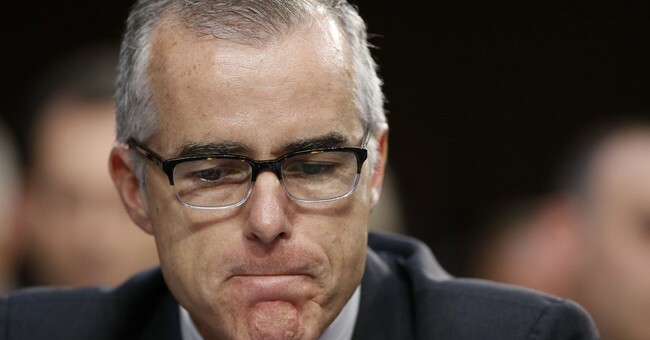 Not only that, his discovery of McCabe's apparent wrongdoing (unauthorized media leaking, about which McCabe later "lacked candor" with investigators) came in the context of a sprawling IG examination of the FBI's handling of various Clinton-related scandals and investigations in the run-up to the 2016 election. That investigation was demanded by Democrats, who cheered its announcement (McCabe's current lawyer even referred to the probe as "welcome news" in a Washington Post op/ed). Also, when did that soon-to-be-concluded investigation commence? Early January 2017, before Donald Trump took office. To recap: McCabe's fireable misconduct was unearthed by a Democrat-demanded inquiry that was launched during the Obama presidency, led by an Obama-appointed and Democrat-confirmed watchdog. (2) After the IG discovered what McCabe had done -- remember, the current, respected FBI Director immediately ceased defending McCabe upon seeing the evidence, and placed him on terminal leave -- those facts were relayed to the Bureau's nonpartisan Office of Professional Responsibility. That office is overseen by an official who was originally elevated to her role by...Robert Mueller. It was OPR, which serves as the FBI's internal ethics department, that recommended McCabe lose his job due to his actions. Sessions did not drop the hammer on McCabe out of nowhere; he did so because the ethics office (populated with non-political, career employees) reviewed the independent IG's findings and rendered a verdict that McCabe should be fired. Those are crucially important facts. Relatedly, I'll add that the American people deserve to see the evidence against McCabe, and the entire IG report, as soon as possible; plus, looking into whether the president's obnoxious lobbying had an inappropriate impact on the timing of McCabe's final dismissal is a legitimate line of inquiry, as well. McCabe is accused of misleading investigators about allegedly giving information to a former Wall Street Journal reporter about the investigation of Hillary Clinton and the Clinton family’s charitable foundation. McCabe asserts in his post-firing statement that he not only had authority to “share” that information to the media but did so with the knowledge of “the director.” The FBI director at the time was Comey...If the “interaction” means leaking the information, then McCabe’s statement would seem to directly contradict statements Comey made in a May 2017 congressional hearing. Asked if he had “ever been an anonymous source in news reports about matters relating to the Trump investigation or the Clinton investigation” or whether he had “ever authorized someone else at the FBI to be an anonymous source in news reports about the Trump investigation or the Clinton investigation,” Comey replied “never” and “no.” The Justice Department’s inspector general clearly saw this “interaction” as problematic in seeking answers from McCabe. If the inspector general considered this to be a leak to the media, any approval by Comey would be highly significant. If the IG concluded McCabe lied, not only should he have been fired, he should be criminally charged. The President should not be calling for individuals, especially those involved in investigating him, to be fired via tweets. McCabe may have acted inappropriately, altho w/o a public IG report it's impossible to know how. A just and fair outcome — as recommended by independent watchdogs — does not become unjust and unfair because a flailing Trump loudly agrees with it. The Left frequently accuses Trump of undermining the independence and legitimacy of Robert Mueller's work, yet that's exactly what many Trump critics are doing with the Inspector General's determinations, in furtherance of their own political narrative. One does not justify the other. Will Media Outlets Employing Qatar-Friendly Analysts Accurately Report On Open Skies Violations?